GPRS, LLC. 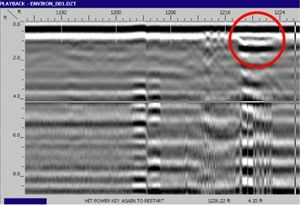 was contacted about performing a GPR survey for the purpose of locating voids beneath the concrete on State Highway 34 near Greeley, Colorado. Recently a natural gas pipeline was installed underneath the road and there was concern by the Colorado Department of Transportation that there was settling under the concrete. When the boring took place to insert the pipe under the road extra soil could have been mistakenly removed causing settling from above. Jason Schaff of Ground Penetrating Radar Systems, Colorado division was called and informed C-DOT about the effectiveness of GPR in reference to void detection. He was able to respond confidently because GPR is a great tool for void locating and our company commonly uses ground penetrating radar for determining the presence of voids throughout the United States. GPRS mobilized to the site and completed the void survey in short order. 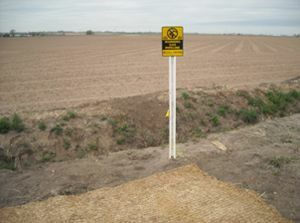 The results were plotted on the concrete in the field and the findings were reviewed with the representatives on site. C-DOT was provided a written report of the findings containing screen shots of the data recorded on site. The data provided by GPRS, LLC. will be significant in developing engineering solutions to the sub-grade conditions that have occurred. Jason Schaff runs GPRS operations in the state of Colorado. He is based in the Denver Area and he can be reached at (303) 945-5415 or by email at jason.schaff@gprsinc.com. To have GPRS search for a void in Colorado, Kansas, Nebraska, Utah or New Mexico, call today. 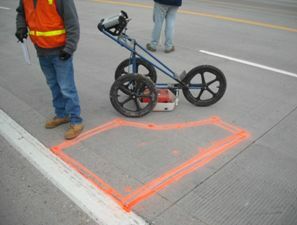 This function of GPR technology can easily be performed in Denver, Omaha, Salt Lake City, Albuquerque, Boise or Kansas City.